Sometimes the pressure of life just gets to be too much. We've all had those moments where life leaves you scattered and worn; you're not sure where to turn next. So many thoughts and issues are swirling through your head--it's hard to quiet all the commotion long enough to get your head back on straight. The other night, as I was driving home from my hometown, a song came on my iPod shuffle that brought me to tears. As the words came through my speakers, tears began to fall and all I could do was pull over onto the shoulder and just sob. The feelings were tangible. Sometimes life throws you curve balls and turns everything upside down, and all you can do is cry. All you can do is be overwhelmed in that moment. I lead a wonderful life, this I know. I'm lucky as I can be and I always hate to complain in light of my blessings. But every now and then, life wears me down just enough to where the feelings get to be too much and all I can do is throw my hands up and have a pity party for myself. I feel like a big mess, even though it's often self-inflicted. My heart gets overwhelmed and it's hard to keep my head above water when I'm overcome with what's going on in my life. Day to day, I get lost in the monotony and feel like I'm missing out on the bigger picture; all I felt was unsettled about what I was and wasn't getting done...what was going right and what wasn't. "I see the work of Your Hands, galaxies spin in a heavenly dance, oh God...all that you are is so overwhelming. I hear the sound of Your Voice, all at once it's a gentle and thundering noise, oh God...all that You are is so overwhelming. I delight myself in You, captivated by Your beauty, I'm overwhelmed, I'm overwhelmed by You." And all at once, as I dwelt on the words, I couldn't help but worship. "I delight myself in You, captivated by Your beauty, I'm overwhelmed by You." The tears fell because I know the feeling of being overwhelmed all too well. My feelings of inadequacy and pain turned into joyfulness and thanksgiving, all in one heartbeat. In that same moment of me feeling down, the Lord grabbed my face in His hands and said, "Child, don't you know that I overwhelm you for a purpose?" He is drawing me nearer to His side by giving me more than I can handle. When life is easy and struggles are nonexistent, God's grace and mercy don't get to show out like He intends. His grace is chasing me, and I'm adamantly denying it by choosing to let circumstances take control. There is joy in the midst of brokenness. Today, I'm choosing to be grateful for a God who loves me enough to overwhelm me. What do you do when you feel overwhelmed? Do you run to the Lord first? I know I'm guilty of depending on myself oftentimes. How do you cope with these feelings? In the end, I just want to be thankful for life's ups and downs, because with every twist and turn, God is drawing me closer to His side. 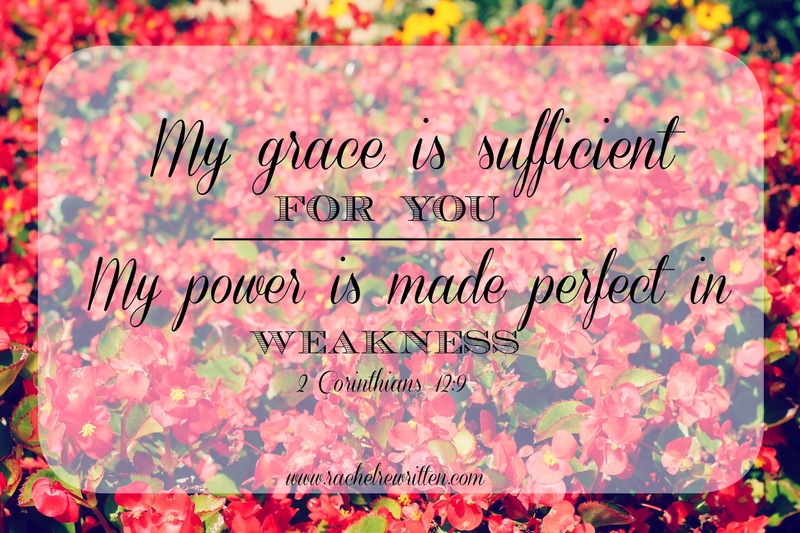 My weakness turns into His strength--what more could I need? His grace is sufficient for me.